As she prepares to move back to her native New Zealand after 30 years in the UK, Juliet Harbutt, cheese educator and campaigner, shares her life in food with Sheila Dillon. As she readies herself for an imminent move back to her native New Zealand after three decades in the UK, Juliet Harbutt, cheese educator and campaigner, shares her life in food with Sheila Dillon. Born and raised in Auckland, an experience with some French cheeses in Paris changed everything for Juliet, who decided there and then that cheese would be her life's focus. She sold her deli-restaurant in Wellington and moved all the way to London, to open up a cheese shop based on her experiences in France. This was the start of a journey that coincided with a huge change in the way Britain approaches, and makes, cheese. This is the story of that period, and Juliet's life in food. 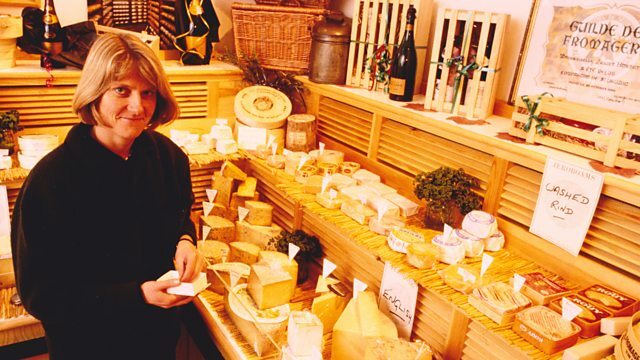 Along the way, Juliet founded The British Cheese Awards and edited the World Cheese Book, which won a Guild of Food Writers Award for Food Book of the year in 2010. Looking back on those three decades, it's a time in which cheese has become one of Britain's great food successes, but it has not been a smooth ride - and things nearly turned out very differently. At its heart, this is a tale about one person's fascination with and passion for cheese, which is, as Juliet says - "a combination of man's ingenuity and one of Mother Nature's finest miracles, milk".